From Goodreads: Polly is caught between the prim-and-proper boarding school set she's grown-up with and the legendary legacy of the Pirate Queen that she never knew she was a part of! But which is the cruel, cold world and which is the care-free paradise? And does it even matter when there's a dashing pirate prince involved? Hoist the sails and batten the hatches on this brand new adventure! 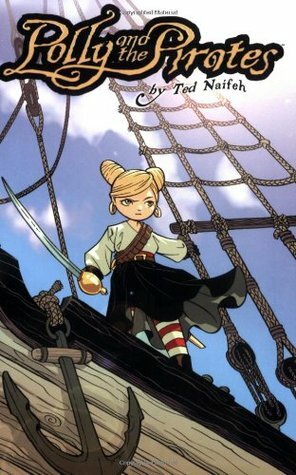 - This was a fun little graphic novel! I've been wanting more pirate stories, so I was excited to pick this up. It definitely filled the pirate void. - The illustrations are really fun. Polly's character design is really cute. I loved her anime buns and tiny feet. - I had a hard time reading Naff's dialogue. It is written phonetically, and it was hard to understand. I had to be okay with not understanding what he was saying sometimes. - There were a few things that were a bit of a stretch. Polly starts off as a proper and shy do-gooder girl, and then all of sudden she knows how to sword fight, plan escapades, and do fancy acrobats. There was nothing in the middle. She just magically knew how to do stuff. - Overall, it was a fun and adventurous story. I liked it, and I was excited to read the second book.